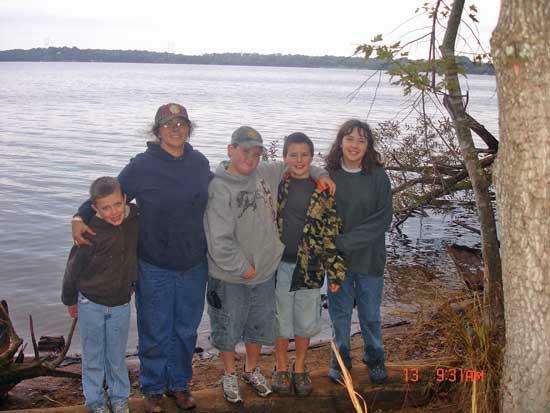 Trista Morten (Scout), Jennifer Stevens (Den Leader), Zachary Melton (Scout), Jacob Williams (Scout), and Jennie Williams on the bank of Old Hickory Lake which borders Boxwell Scout Reservation. Good fishing hole! The Webelos den from Cub Scout Pack 327 had an exciting weekend October 9th-11th. Three of the Webelos Scouts (Jacob Williams, Zachary Melton, and Tristan Morten) with parents, siblings and their adult leader attended a Cub & Family campout at the Boxwell Scout Reservation near Lebanon Tennessee. Neither the rain, nor the cool weather dampened the spirits or fun for anyone. There were many activities for the boys (and the whole family) to enjoy. BB guns and archery, obstacle courses, fish races, egg toss, tire bowling and fishing were only a few of the fun activities we enjoyed. Saturday evening was a huge success as these boys and their friends were selected to perform a skit at the main campfire. Way to go boys ... you did a GREAT job! Special thanks to the “Echo” (Jennie Williams) as we couldn’t have done it without her! Everyone was given the opportunity to view and show their respect for our flag as a flag retirement ceremony concluded the campfire festivities. Then back to our camp for some good old Dutch oven cobbler, hot chocolate and some good conversation about the weekend and the memories we made. More fun and excitement is on it way …… so keep watching for more news on Cub Scout Pack 327!